Ascent: All-new turbocharged 2.4-liter BOXER engine for Subaru’s largest model. The 2019 Subaru Ascent made has made its debut at the 2017 Los Angeles Auto Show, the largest model ever produced by this once niche Japanese automaker. Available in seven- or eight-passenger configurations, the all-wheel drive 2019 Ascent should keep Subaru shoppers searching for a large, family model from running to the competition. Not since the Tribeca has Subaru yielded a model so roomy. This time, the automaker modified its “Subaru Global Platform” to build an SUV packed with the latest technologies, safety features, and capped by a Subaru-first 5,000-pound towing capacity. Going big was something Subaru had to do, but we weren’t sure how they would do it. The new model sits on a 113.8-inch wheelbase, easily within the range of competing models such as the Toyota Highlander (109.8 inches), Chevrolet Traverse (118.9 inches), Honda Pilot (111 inches), and the Ford Explorer (112.8 inches). 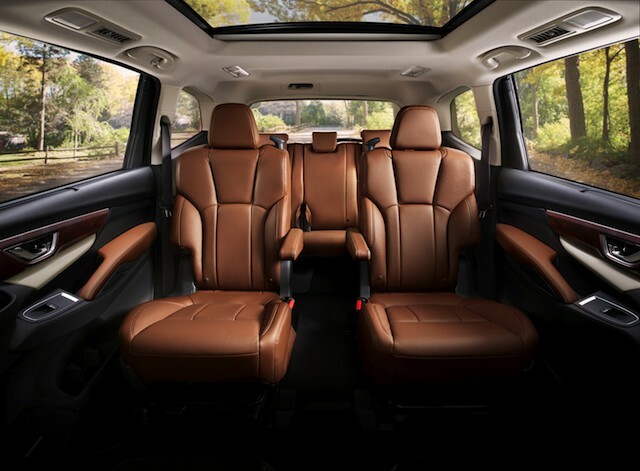 As for the 2019 Ascent, it goes beyond the familiar Subaru design language to include such features as rear doors that pivot by 75 degrees for ease of access to the second- and third rows. Shoppers can opt for either second-row captain’s chairs or a bench seat, the latter enabling the Ascent to carry eight people. You’ll also find a 153.5 cubic foot interior and generous cargo space. 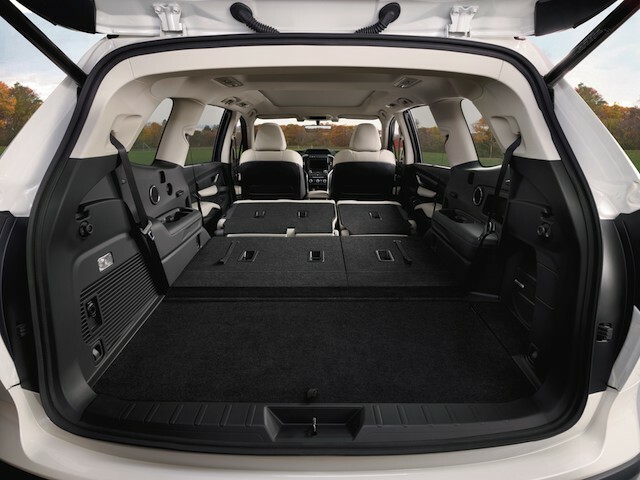 Indeed, standard cargo space measures 19.6 cubic feet behind the third row, more than 40 cubic feet behind the second row and nearly 72 cubic feet with both the second- and third-row seats folded. Four grades are available: Ascent, Premium, Limited and Touring. The roomy cabin also features such standard amenities as three-zone climate control, second-row reading lights, available third-row lights, power adjustable front seats with lumbar support, 19 standard cup and bottle holders, eight USB charging ports, and an available 120-volt power outlet. Under the hood, Subaru introduces a new engine — a 2.4-liter turbocharged four-cylinder BOXER engine. BOXER engines come with horizontally-opposed cylinders, a layout common to Subaru and Porsche models. The new engine features a combination of high compression, direct fuel injection, a twin-scroll turbocharger and intercooler, and a valve control system to produce 260 horsepower at 5,600 RPMs and 277 pound-feet of torque across a 2,000 to 4,800 RPM range. Working alongside the engine is a continuously variable automatic transmission with an eight-step manual mode by means of the steering wheel-mounted paddle shifters. 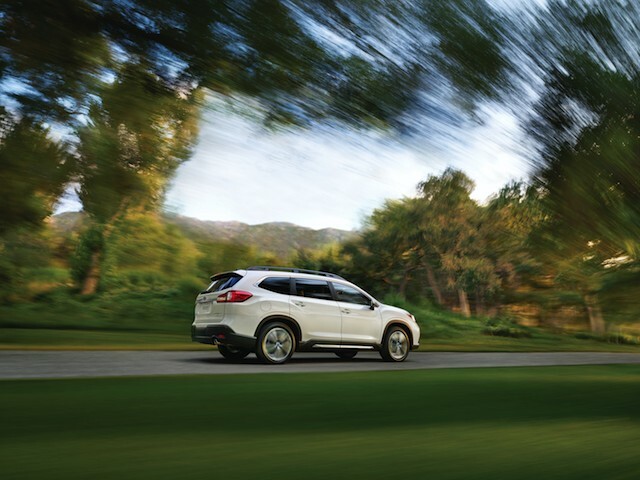 As the largest Subaru model, the 2019 Ascent also offers a complete suite of technologies. A 6.5-inch multimedia system on base models gives way to an eight-inch system with available navigation elsewhere. 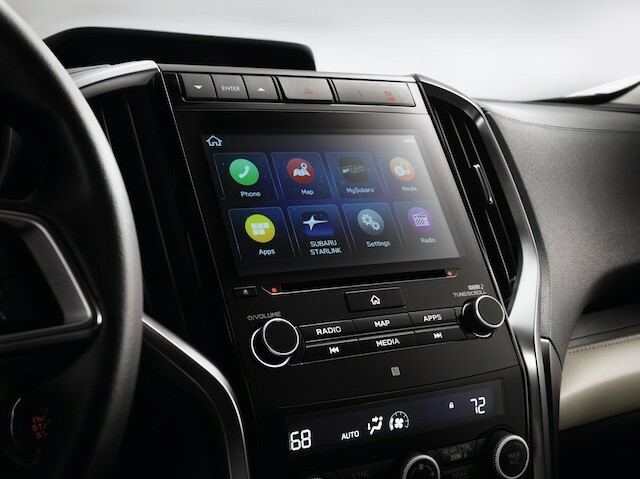 Moreover, the system supplies smartphone integration with Android Auto and Apple CarPlay, Aha and Pandora, Bluetooth connectivity, a rearview camera, and satellite radio. Further, you’ll find a Subaru first: in-car WiFi connectivity with high-speed LTE. Also, the Subaru STARLINK connected car services are included, bringing with it emergency assistance, enhanced roadside assistance, and available stolen vehicle recovery and related services. Subaru supplies a long list of standard safety technologies under its EyeSight Driver Assist Technology umbrella. Specifically, automatic pre-collision braking, adaptive cruise control, lane departure and sway warning, pre-collision throttle management, and an available heads-up display. Other available safety technologies include reverse automatic braking, front view monitor, smart rear view mirror with expanded sight lines, and various lighting upgrades. The 2019 Ascent arrives next summer, therefore pricing information wasn’t shared. Typically, manufacturers release such information just ahead of a new model’s release date. That said, we expect well-equipped models to cost about $40,000, which is the usual price point for competing models. 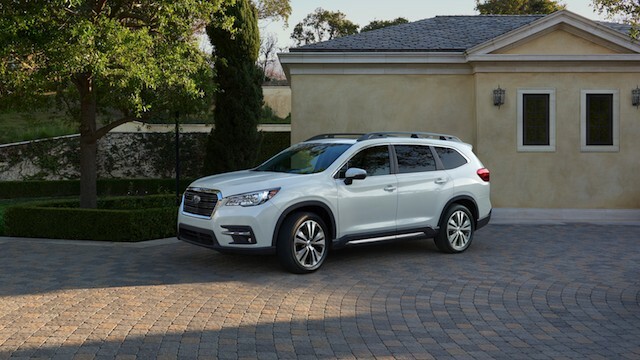 To sum up, the 2019 Ascent completes Subaru’s product line, giving customers every reason to stay with the brand, while likely ensuring that this once niche automaker continues its decade-long growth spurt. Photos copyright Subaru of America, Inc. All rights reserved.